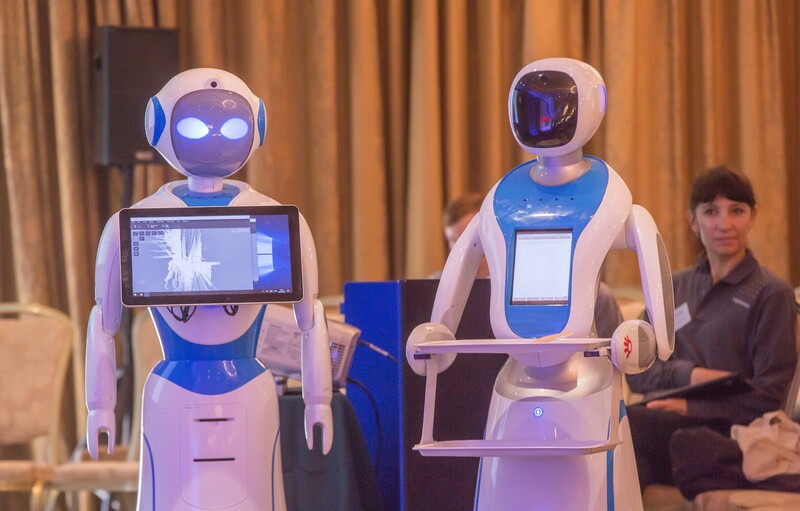 The medieval city of Kilkenny in southeast Ireland was the location of a decidedly future-oriented event on the weekend of 20 October: DojoCon 2018 took place in Kilkenny’s Newpark Hotel. 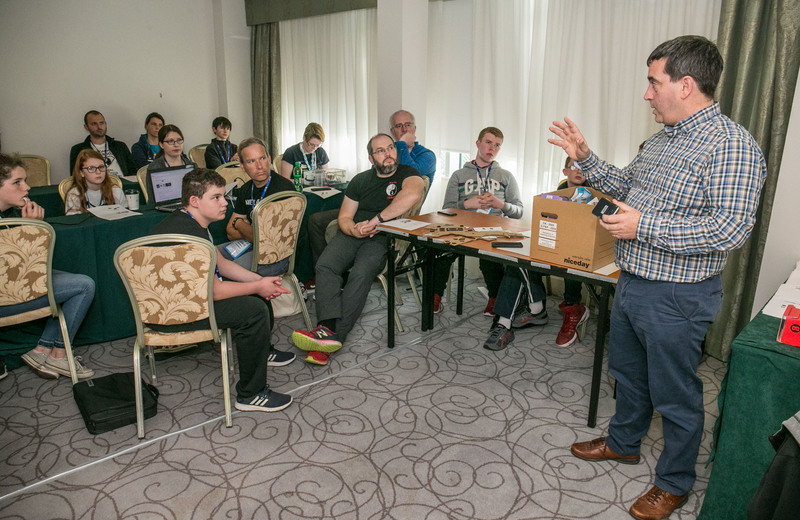 Organised by CoderDojo Kilkenny, this year’s international volunteer conference spread across two floors of the hotel, and more than 400 enthusiastic champions, mentors, and other people involved in the CoderDojo movement travelled from 12 countries; Serbia, Italy, UK, Moldova, Romania, Czech Republic, Portugal, Ireland, Netherlands, Belgium and Nigeria to share with and learn from each other. 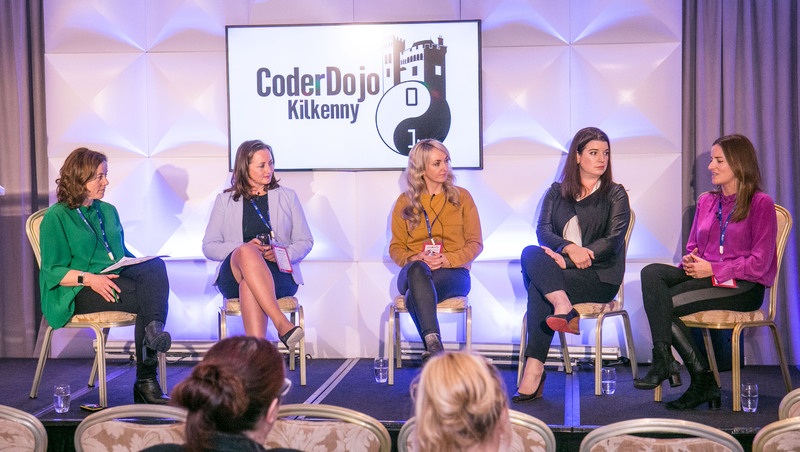 Nuala McHale, Communications Manager at the CoderDojo Foundation, opened the event, thanking the proud sponsors, which were local businesses as well as big industry partners: Oracle Academy, Carlow IT, and the Expedia Group. 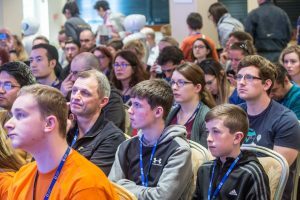 DojoCon Kilkenny put together a diverse and inspiring mix of speakers, workshops, and partners. 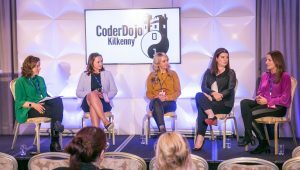 One focus of this DojoCon was on how to make technology and careers in this sector accessible and interesting to girls, and many women were invited as speakers and presenters. 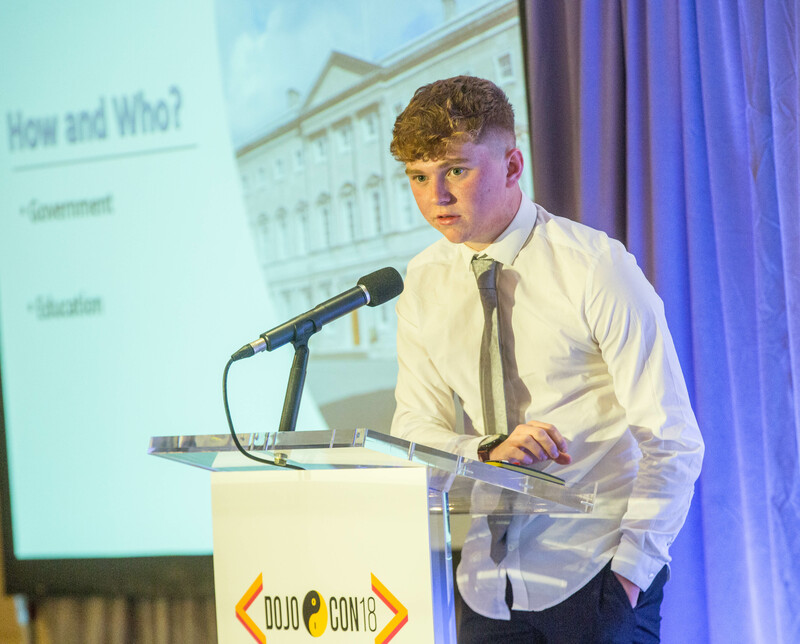 The event’s keynote speaker was Jordan Casey, an 18-year-old entrepreneur from Waterford, Ireland, who has been involved in the technology industry for the past three years and has founded several startups. He gave a presentation about the Teenage Entrepreneur Movement. Other speakers included Brenda Romero, who spoke about her gaming company Romero Games and about becoming a game designer; Nicky Thompson from FutureLearn, who shared advice about career paths in technology; and James Tubbritt from Emagine, and Darya Yegorina from CleverBooks, who spoke about virtual and augmented reality. There were also illuminating panel discussions about ‘Women in Tech’ and ‘Global Travel to Outer Space’. Throughout Saturday, there was 49 workshops covering six topic areas: Design it, Create it, Code it, Make it, Discuss it, and Share it. Design it workshops were run by Glasseye, Cartoon Saloon, and two Institutes of Technology, and covered digital and code-generated art, animation, and 3D animation. Code it workshops covered Greenfoot, Microsoft HoloLens, drone coding in Scratch and C, and other tools and languages. Make it workshops taught participants how to, for example, build VR headsets, origami kinetic sculptures with paper and Arduino, and lightboxes, and showed them how to use Mycroft and Turtlestitch. In the Share it workshops, volunteers shared lessons they had taken away from their Dojos, for example about how libraries can make a difference to the Dutch off syllabus, how to make Dojos more inclusive, and how to create a learner-led environment; about Zen and what it means to build tools for a community, and the positive and negative influences technology can have on children. On Sunday, the DojoCon hosted more than 200 young people at the Rob the Bank Hackathon. The goal was to help children learn cybersecurity skills and to encourage them to consider a career in that area. The activity was based on real security incidents and the real tools used by cybersecurity professionals! 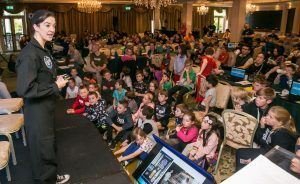 DojoCon in Kilkenny was a fantastic event, and one that we at the CoderDojo Foundation were extremely proud to be a part of. The display of skills and knowledge was both educational and inspiring. All in all, it was a jam-packed weekend of tech, thought-provoking conversation and, most importantly, fun for everyone! The first DojoCon happened in 2012 in Limerick, and this annual international conference has since taken place in Slane (Ireland), Sligo (Ireland), Derry/Londonderry (Northern Ireland), Warrington (UK), and Dun Laoghaire (Ireland). 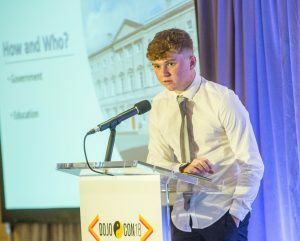 I would like to take this opportunity to thank DojoCon Kilkenny for organising this year’s event and to all the previous organisers for allowing this event to grow in such a unique way. Given the overwhelming success of regional DojoCons in several locations worldwide, we in the CoderDojo Foundation team have decided to shift our support away from one single international DojoCon to focus on helping you run DojoCons as regional events for everyone in your local communities. 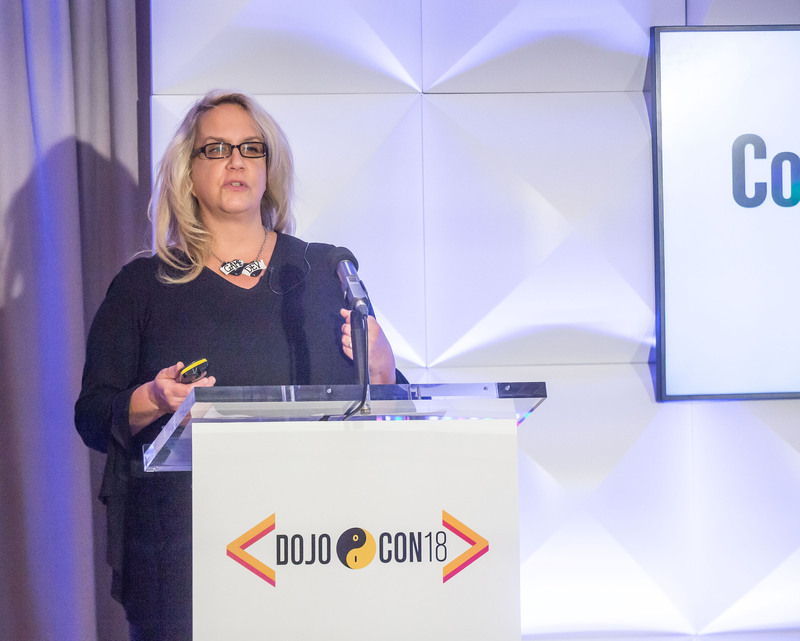 You can read more about the CoderDojo Foundation and how they will support future DojoCons here.